We live in reactionary times. The powers-that-be have seized the centenary of the First World War to promote nationalism. Under the guise of historical research — appropriately headed by the Imperial War Museum — adults and school children are revamping war memorials, searching for long-forgotten family ‘heroes’ and are already being fed a diet of what ‘everyone’ endured before peace finally broke out. Even before the years of official ‘commemorations’ have begun the media have embarked on a First World War binge. At this rate war fever will be at its height by August 4th. They want to be careful: they just might sicken off most of us before the 21st century style jingoism really gets going. Not so very long ago the ruling class was wary about appearing to condone the first global war in history. Commemorations of the First World War tended to be slipped in alongside the Second, ‘Good’ World War — the ‘People’s War’ to save civilisation from Nazism and fascism and which had ushered in a new, levelled-down consumer society where we all would live more comfortably for ever and ever. That was the myth anyway. No such myth could be invented about the First World War. It was difficult to pretend that the bloodbath which had killed 20 million or more people (military and civilians) and which was shortly followed by the Depression and an even bigger world war, had been anything other than a power struggle between rival states. At stake for British capitalism was its dominant position in the world, its sea routes and its empire. Long before 1914 capitalist competition had become a question of states defending their ‘vital interests’ in a global economy where late start-ups like Germany and the United States were seriously challenging British supremacy. From 1890 the ‘great powers’ were upping their military budgets and engaging in secret alliances. Amongst the unlikely allies of the British state was Tsarist Russia, where conscripts knelt in the mud in front of their Tsar before going of to battle. This fact alone should be enough to dispel the idea that British war aims were about saving ‘civilisation’ let alone ‘democracy’. Yet it was from the example of working class revolution in Russia that the carnage was eventually stopped. “Peace” was the prime demand of the first revolution in February 1917 and the refusal of Russian soldiers to continue firing at their “brothers in uniform” had caused consternation, not least in the British War Office. From then on workers in uniform, of whatever stripe, could see that the continuation of the war rested solely on their remaining willing to fight. When the October Revolution proclaimed ‘All Power to the Soviets’ the example of HOW a new society could be organised on the basis of direct democracy was a beacon to the world’s working class. From then on the capitalists’ war was undermined by the growing threat of working class revolution which had its echoes in Britain and which eventually brought the ‘Great War’ to a close. In 1914 many workers had gone off to fight for ‘King and Country’ and joined up with their ‘pals’ to fight in the war that would be over by Christmas. By 1918 a million and a half troops were stationed at strategic points near industrial centres across Britain as the state prepared against working class revolution. The tide had turned. The minority of class conscious workers who had said from the start that the war was an imperialist war that pitted worker against worker were now being proved right to the rest of the working class. Of course the revolutionary wave was defeated, capitalism re-established its grip and Russia’s soviet democracy wiped out by a vicious state capitalist counter-revolution, all in the name of communism. Today we are told that communism is dead and anyway impossible. Even the working class is a thing of the past: we’re all ‘ordinary people’ now, each with our own personal interests and dreams to follow. Still, as we prepare to face up to the barrage of what the First World War Did for Us, there is an uncomfortable parallel between the long drawn-out economic crisis of world capitalism that led up to 1914 and the present world crisis. Even if outright war between today’s ‘great powers’ is not yet on the agenda, more and more ‘failed states’ are disintegrating into barbaric civil warfare as a growing part of their populations face unemployment and destitution. The antagonism between wage labour and capital is still at the heart of the world we live in today. Just as in the run-up to the First World War and in the Depression before the Second, capital is pushing the cost of its crisis onto the shoulders of the working class. The question is once again being posed of what sort of world we want to inhabit. Capitalism’s propaganda machine is working full tilt for the hearts and minds of the working class. Just as in the past, so now, the royal family and a modern version of jingoism are being employed so that workers think of their ‘nation’ before their class. Just like the Victorians, we’ve had the royal jubilee, the royal wedding, the royal baby, interspersed with the queen appearing at the royal Olympics, all accompanied by a growing celebration of nationalist militarism. In the 1960s and even in the 70s, when the working class were still confident of a better future, and when many from the generation who lived through the First World War were still there to tell the tale, war commemorations were limited to an increasingly obscurely named ‘poppy day’ and a news item on the ceremony at the cenotaph in London. How different now, when, on the anniversary of the armistice, virtually every public place in every town in Britain imposes 2 minutes silence — not for the victims of war — but for so-called ‘heroes’; when virtually no-one appears on television without the compulsory red poppy. We invite anyone who shares this perspective to join us in countering the official propaganda. Watch out for the internationalists blog on Capitalism’s Great War. 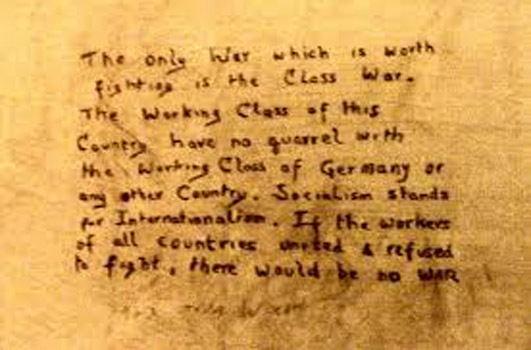 No War But the Class War! Overproduction is generally rated as a key aspect of capitalist imperialism. Some well-informed historians might know whether there was overproduction of horse-drawn ploughs prior to 1914, but, in any case, if the many horses of 1914-1918 had been harnessed to them, rather than to artillery, Flanders and other fields would have looked very different.